Top-ranked Rossville travels to Seneca to take on undefeated Nemaha Central in a game that feels more like a state semifinal match-up than one for a trip to the state quarterfinals. Defending champion Rossville has gone wire-to-wire as Class 3A’s No. 1 teams this season. Much gets made about the ridiculous numbers of senior quarterback Tucker Horak; and for good reason. Horak has accounted for 3,567 yards of total offense and a combined 58 touchdowns this season. Horak has rushed for 1,925 yards and 34 touchdowns and completed 80 percent of his passes for 1,642 yards and 24 more scores. Junior Dawson Hammes has contributed 882 yards rushing and eight touchdowns for the Bulldawgs. Junior Cole Schumacher leads the team with 588 receiving yards and nine touchowns on 28 receptions. Senior Christian Roduner leads Rossville in receptions with 37, and has 425 yards receiving and six touchdowns. Hammes leads the defense with 98 stops, while Issac Luellen has registered 13 sacks. Nemaha Central will try and contain Horak with a defense that has surrendered only 94 points in ten games this season. Five different Thunder players have registered between 42 and 48 tackles on the season. On offense, Nemaha Central averages 44 points per game. Kyle Rethman leads the Thunder with 889 yards rushing and 14 touchdowns, while Koelzer has added 341 yards and seven scores. Junior Ryan Hasenkamp has accumulated 1,936 yards of total offense. Hasenkamp has passed for 1,376 yards and 13 touchdowns, while rushing for 560 yards and 12 scores. Tristan Allen is Hasenkamp’s main receiving target with 684 yards and six touchdowns. On Tuesday, Rethman rushed for 114 yards and two touchdowns in the Thunder’s 56-12 win over Riverside. Horak passed for 275 yards and four touchdowns and rushed for 112 yards and two scores as Rossville shut out Maur Hill-Mount Academy, 49-0. Norton has become a much different team since senior all-purpose threat Gavin Lively returned following a five-week absence because of a knee injury. The Bluejays have won four straight games. Sophomore quarterback Jace Ruder has completed 81 of 181 passes for 1,091 yards with eight scores versus six interceptions. Ruder didn’t play in the second-round home 55-20 loss to Scott City last year because of injury. Sophomore Tevin Petrie has 107 carries for 840 yards and seven scores. Lively, despite playing in just five and a half games, has 71 carries for 811 yards and 15 rushing scores. He also has caught eight passes for 244 yards and three touchdowns. He leads the squad with 1,122 total yards and 18 total scores. When Lively has played in the game, Norton is 6-0 and has averaged 40.3 points and 396.8 yards per game. When he hasn’t played, the Bluejays are 2-2 and averaged 28.3 points and 320 yards a contest. Norton, with an entirely new group of wide receivers from a 10-1 team, has averaged 13.7 yards per catch. Junior Jacob Green is a first team all-state player with 109 tackles, 28 TFLs, five forced fumbles and four fumble recoveries. The Bluejays are 6-0 at home and 2-2 on the road, including a 7-6 Week 2 road win against rival Phillipsburg in the game Lively suffered the injury late in the first half. Scott City is 3-1 in the last seven years versus Norton. Scott City, Silver Lake and Bishop Carroll win with a metronomic consistency that’s different than the rest of Kansas. 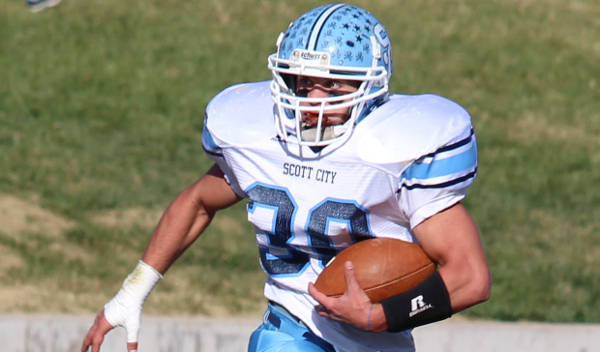 Scott City is now 90-8 in the last eight years with double-digit victories each season. The Beavers are the only team to accomplish the feat, although Silver Lake (9-1) can tie the mark with a win Saturday. Carroll (8-1) has done it six consecutive seasons. The offense, led by running backs Wyatt Kropp and Cooper Griffith, has averaged 399 yards a game, including 290 on the ground. Junior Bo Hess has settled into his first year at quarterback with 61 of 111 passing for 1,084 yards with 13 scores versus five interceptions. He has completed at least 70 percent of his passes in five of the past six contests and hasn’t thrown an interception in five games. Griffith has 1,241 yards with 22 scores, and Kropp, in just seven games, has 393 yards and seven rushing touchdowns. Griffith paces the defense with 108 tackles and 22 for loss, while senior Abe Wiebe is second with 84 tackles, 21 for loss. Scott City has permitted 69 points, No. 2 in the classification, two points behind Wellsville. It held district winners Colby, Holcomb and Ulysses all under 200 total yards. Scott City has contained some of the state’s best offenses. With the improvement of Hess, the Beavers are possibly 3A’s best team on the west again.